Posted 2 years ago on Friday, September 29th, 2017 by James S.
I bought a 99 Mustang GT with 118,000 miles on it to use as a daily driver. 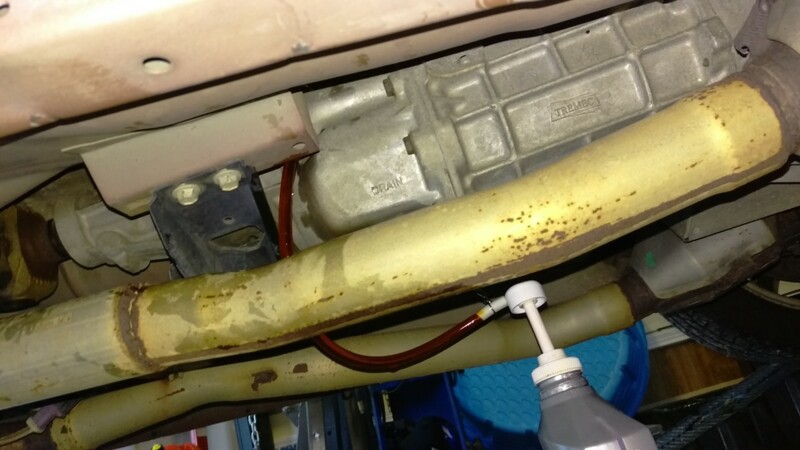 One of the basic maintenance items on an older vehicle is to make sure to flush transmission fluid. 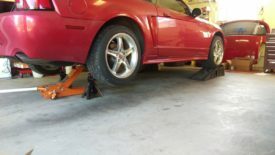 Fortunately, 99-04 Mustang transmission fluid changes are very easy, especially on a manual transmission like this one. To do this job, the whole car is going to have to be in the air. I’m personally not comfortable getting under a car on four jack stands, especially since my garage is sloped. Instead, I like to put the front tires on rhino ramps or other wheel ramps and put the rear end on jack stands, as shown. This lets me adjust the height of the rear to get the car level as well, which is important for this job. The transmission is in the very center of the car, underneath the floor pan between the front seats. Here’s a view from the passenger side showing where to look. 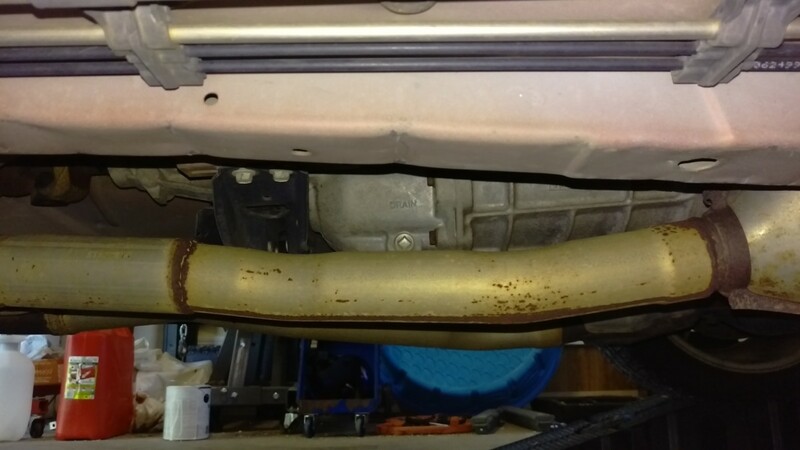 It’s just behind the exhaust pipe. I try my best to get the car raised level. Like many manual transmissions, the Mustang has a drain and a fill plug. Before doing anything, you want to remove the fill plug. 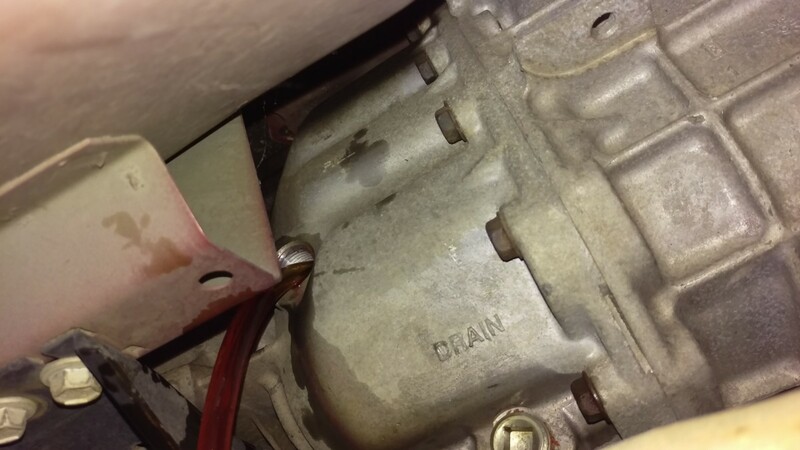 In the event that it’s too stuck to remove, you can still drive the car on the old transmission fluid. If you pull the drain plug first and can’t get the fill plug off, you’re in trouble. 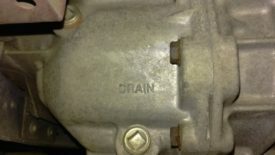 Of the two plugs shown above, the fill plug is the one higher up on the transmission. With the fill plug out, you can safely drain the transmission. 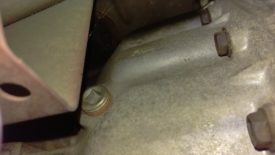 Place the oil drain pan under the transmission and remove the fill plug. The old transmission fluid should come pouring out. Try your best to let all of the fluid run out of the car. 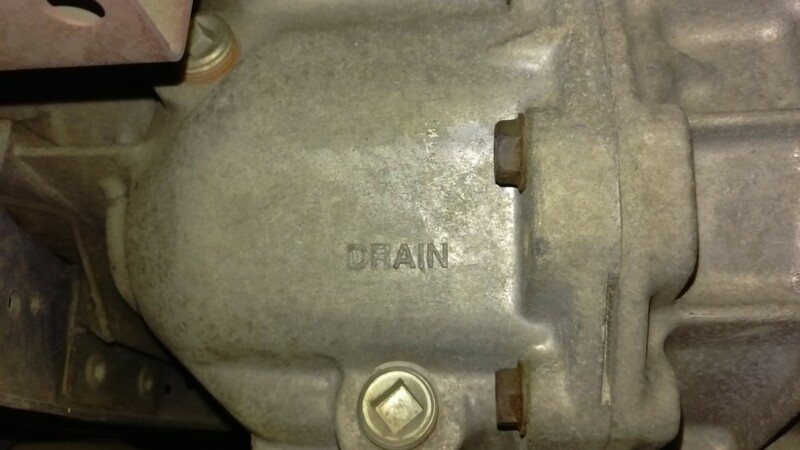 Once it’s drained, go ahead and reinstall the drain plug. Then, you can attach your fluid pump to the first bottle of Mobil-1 ATF . Here’s a better shot of the pump and the fill hole. You can begin pumping fluid into the transmission. Regarding capacity, there are two options. The manual recommends 4.0 quarts for my car, which should be filling it until fluid comes out of the fill hole. However, apparently Ford revised this down to 3.3 quarts later on, which would be about 1/2″ below the fill line. I chose to do the latter, and I haven’t had any problems, for whatever that’s worth. 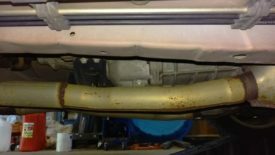 This is an easy DIY job that can help extend the life of your transmission. I was hoping that it would help my car slide into gear more easily, but so far this doesn’t appear to be the case. 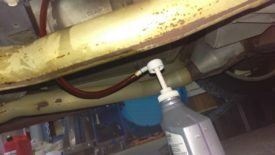 Still, it’s worth a shot, as old transmission fluid can gum up syncros and cause excessive wear and other problems. On another related note, a lot of people remove the shifter and fill from the shifter turret instead of using a hand pump. This should also work on Mustang transmissions, although I’m both afraid of getting oil in the cabin and too lazy to do this personally.